So then, Kramit in a nutshell... Covers band and Original Music as required... "Folk to Funk and everything in between"
...well they have been playing together for the past 17 years. Originally from Southland, now happily based in “Sunny Nelson” NZ! Kramit have been busy (between gigs) recording the all original album “Electric Chocolate” (Acoustic Alt-Pop) and re-releasing their 2009 award winning album The House of Kramit - The Next Session. Whether playing original music or their diverse repertoire as a covers band, sweet harmonies and groovy bass lines drive their sound. Exciting stuff! Keep looking at www.kramit.co.nz & for more info! Candy and John began performing original material during the year 2000 while they were attending the Southland Polytechnic, now Southern Institute of Technology. They released their first studio album, Purely Secrets, in December of 2003. During 2007 “Kramit” became “The House of Kramit” due to the involvement of other artists in the band, ranging from a 5 piece rock band to the 11 piece line up featured in the Past & Present DVD which was recorded in April of 2007. Due to many technical problems The House of Kramit - Past & Present wasn’t released until November of 2009. 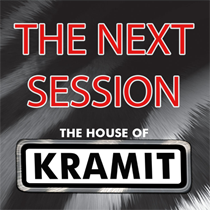 That year also saw Kramit returning to the studio to record their second album, The Next Session, a collection of Kramit songs arranged for a full rock band. The Next Session was released in December of 2009 and at the Southland Entertainer of the Year Awards, 2010, it was awarded "Southland Original Album of the Year". Now their latest release “Electric Chocolate” has been taking the world by storm! 26 April - Speight's Ale House, Nelson! 27 April - The Wakefield Hotel, Wakefield! 11 May - The Turf Hotel, Stoke! 18-19 May - Wahine Aroha, Women's Retreat! 31 May - Speight's Ale House, Nelson! 15 June - The Turf Hotel, Stoke! 22 June - The Wakefield Hotel, Wakefield! 28 June - Speight's Ale House, Nelson! 13 July - The Vic Mac's Brewbar, Nelson! 20 July - Speight's Ale House, Nelson! 16 August - Speight's Ale House, Nelson! 24 August - The Turf Hotel, Stoke! 14 September - The Turf Hotel, Stoke! 20 September - Speight's Ale House, Nelson! 28 September - The Wakefield Hotel, Wakefield! 19 October - The Turf Hotel, Stoke! 25 October - Speight's Ale House, Nelson! 14 December - The Turf Hotel, Stoke! Want to find out what the rest of the "Kramit Empire" is up to?